These blocks are lots of fun to make. They are made with 2 1/2″ fabric strips. You can use jelly rolls and make the blocks even faster. Sewing the blocks together into a quilt top is really simple. You can watch how to sew the blocks together in the video. I like hexagon blocks so much I even made a hexagon block sampler quilt, Hexagonal dream. Check the details below. Hexagonal Dream is a hexagon sampler quilt.The quilt is put together without Y seams. Quilt size: 60” x 59 ½”. Number of blocks: 48 hexagon blocks with 11 different block types and 8 half hexagon blocks. Finished hexagon size: 7 ¼” x 8 ½”. The quilt is jelly roll and fat quarter friendly. Skill level: I’ve rated this quilt as confident beginner / intermediate. A 60 degree ruler is recommended but if you don’t have one you can always use a square ruler with 60 degree markings or the template that comes with the pattern. So how did I make this quilt? If you have any questions about the pattern, please feel free to contact me via the form on the About this blog page. Quarter Snow Ball is the first block in the book. It’s perfect for new quilters as well as experienced ones. So easy yet so versatile. You will find 1 quilt pattern featuring this block in the book and 3 illustrated quilt pattern variations. This block has so many possibilities that after you do the 4 variations I’m sure you’ll be able to find a few more and make your own quilt design. Today we’re joined by Jen of Patterns by Jen, Lorinda of Laurel, Poppy and Pine, Kate of Seams like a dream, Sandra of Sandra Healy Designs, Moira of Quilt Design Duo, Lynn of Puppy Girl Designs, Sarah of Sarah Goer Quilts and Tammy of Tamarinis. They’ve made blocks and full quilts using this block. Don’t forget to check their fantastic quilts and blocks they’re made for this occasion as well as read their experience with the book. After you check their posts enter their own giveaways! Today we have a great giveaway. When I designed Tutti-frutti I did so with Denyse Schmidt’s modern solids 5” charm pack in mind. Free Spirit fabrics, who also provided most of the fabrics for the quilts in my book, is kindly giving away Denyse’s 100 charm pack and 1 yard of solid cream to make this Tutti-frutti. Isn’t that great? To win, tell us in the comments which one is your favourite quilt made with this block: Arrowhead, Sweet Bows, Tutti-frutti or Sun Dunes. 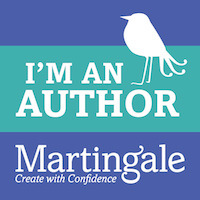 Starting on Wednesday 30 January and until February 9, over 30 fantastic quilt designers and bloggers will feature one project from my book Turnabout patchwork. Watch a preview of many of the different projects in the book. More photos to come over the next few days as my fellow quilters and bloggers review my book in their blogs and show their work. Don’t miss out! Check the schedule below. And don’t forget to come back often because there will be giveaways every day. The first one starting today! 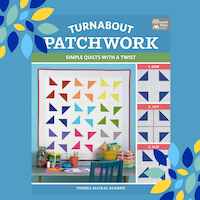 In case you missed its release, Turnabout patchwork is all about playing with blocks – making a block, slicing it up, and turning or repositioning the pieces to make a completely different block (sometimes two smaller blocks) to yield endless quilt tops. The book explores options for turning 6 blocks into a total of 23 quilt patterns. It’s a book born of what-ifs rather than one focused on achieving quilting perfection. To encourage you sticking with me for the next few days, I and my fellow blog hop quilters are hosting some giveaways. 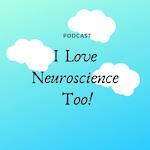 So why not start today giving away one copy of my book in electronic format? 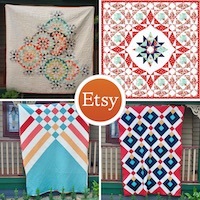 Just choose one of the 6 main quilts below and add a comment on why you selected it. I will do a draw at the end of the blog hop and inform the winner. Good luck! A cog in the wheel is an easy modern quilt pattern suitable for confident beginners. You can choose which technique to use in making it. Included are instructions and templates for traditional piecing and foundation piecing. In the 12 page pattern I have included lots of colour diagrams as well as written instructions and alternative colourways. Bonus: links to a video tutorial to make the block with foundation piecing. The beautiful quilting was done by Shannon Hackett from The Other Quilter. Turnabout Patchwork. Simple quilts with a twist was officially released on 3 December 2018. It’s all about playing with blocks – making a block, slicing it up, and turning or repositioning the pieces to make a completely different block (sometimes two smaller blocks) to yield endless quilt tops.